What conditions does Penlac Solution, Non- treat? List Penlac Solution, Non- side effects by likelihood and severity. Before using this medication, tell your doctor or pharmacist your medical history, especially of: diabetes, numbness in fingers/toes (such as diabetic neuropathy). What should I know regarding pregnancy, nursing and administering Penlac Solution, Non- to children or the elderly? 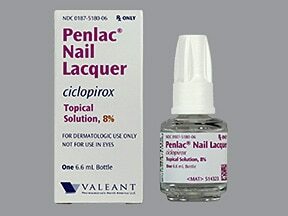 Are you taking Penlac Solution, Non-? Are you considering switching to Penlac Solution, Non-? How long have you been taking Penlac Solution, Non-?